Cabbage is a delightful cruciferous vegetable but chances are you are more familiar with its siblings’ broccoli and cauliflower. Unfortunately cabbage doesn’t get a lot of press or attention in the United States unlike many other countries–when I lived in Costa Rica it didn’t seem matter what time of day there was always a cabbage salad included in the meal. So why should cabbage get more attention? Cabbage contains the amino acid glutamine along with the anti-inflammatory glucosinolates which help heal an inflamed digestive tract. Inflammation in the digestive tract can be caused by a variety of insults including alcohol, overuse of ibuprofen, parasites, bacteria, excessive acid production, a recent stomach virus, and food sensitivities. The glucosinolates in cabbage also specifically targets the bacteria helicobacter pylori (h pylori) in the stomach which is not an easy feat. H pylori are common bacteria found in about 50% of people globally that can cause ulcers, reflux, nausea, and increase risk of stomach cancer. The conventional protocol to kill h pylori involves at least 2 antibiotics, bismuth, and a proton pump inhibitor like Prilosec. 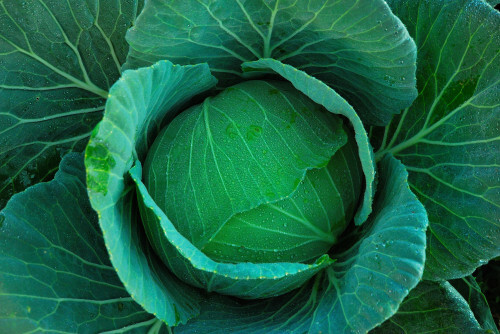 By eating cabbage so you can experience a powerful treatment without all the side effects of medications. Cabbage juice has also been shown to completely heal stomach and intestinal ulcers in under 10 days when consumed daily compared with 40+ days of conventional treatment. The glucosinolates found in cabbage have been shown to prevent bladder, colon, and prostate cancer. The anthocyanin in cabbage makes it a great source of anti-oxidants as well which protect cells from damage. Cabbage, along with other cruciferous vegetables also contains sulforaphane, a chemical found to have potent anti-cancer properties. Research on sulforaphane has exploded in recent years not only for its effect on cancer cells but also Parkinson’s disease, Type II Diabetes, H Pylori, platelet activity, and on and on. A search of the literature revealed over 900 published articles in peer reviewed journals highlight sulforaphane so there is definitely a buzz around the potential of this amazing chemical naturally occurring in cruciferous vegetables. Enough talk, time to get busy with this great recipe. Toss everything in a high powered blender and enjoy the many benefits of cabbage juice. Cheney, Garnett “Rapid Healing of Peptic Ulcers in Patients Receiving Fresh Cabbage Juice.” Calif Med. 1949 January; 70(1): 10-15. Lacy BE, Rosemore J. Helicobacter pylori: ulcers and more: the beginning of an era. J Nutr. 2001;131:2789S–93S. Mullaney JA, Kelly W, McGhie TK, Ansell J, Heyes JA. “Lactic acid bacteria convert glucosinolates to nitriles efficiently yet differently to Enterobacteriaceae.”J Agric Food Chem. 2013 Mar 6.